Born in Glasgow in 1952 and now living on the Clyde Coast, Grant McLeman started writing in the 1970s. He was published in some anthologies and won three diplomas in the Scottish Open Poetry Competition. He then stopped writing virtually completely. There followed a period in which Grant concentrated on a number of activities including obtaining his B.A. Degree. In 2002 he was encouraged to resume writing after Scottish 'Poet Laureate' Edwin Morgan who was involved in several projects with Tommy Smith, read and appraised some of his work. This would lead to a collaboration with renowned U.S. photographer Martin Lueders resulting in them producing broadcast pieces throughout 2003 for the U.S. cable T.V. programme Coffee House. 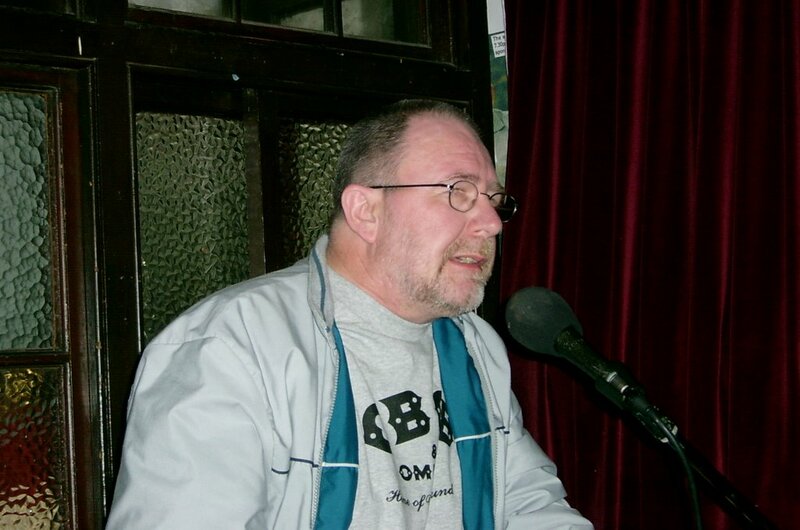 He has since been connected with the Limerick based Whitehouse Poetry Society with whom he has read (as guest poet) and has had a 'poem of the week' published on-line. The Whitehouse poets publish a poetry journal called 'Revival' and Grant has been published in five issues. He is now a regular attender at Cuisle, the Limerick International Poetry Festival where he performs 'open mic'. He is also published in the Autumn/Winter 2006 edition of the Californian magazine 'Monterey Poetry Review'. 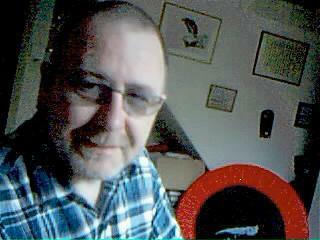 In addition he has a number of poems available in several issues of the on-line and print magazine 'Four Volts' (now named 'Neon Literary Magazine') and in the Spring edition of the on-line 'MindFire Renewed'. Links to both these publications are available on this site. He has also been invited to read at Bob Holman's Bowery Poetry Club in New York and is a member of the St. Mark's Poetry Project in the same city. 2007 and 2008 saw some of his work showcased on Laura Hird's literary site (www.laurahird.com) where he now has 11 poems on view , some more poetry published by FourVolts and another appearance in 'Revival'. He also teamed up with Chicago photographer Lloyd DeGrane to produce a piece for broadcast on 'Coffee House'. This was a welcome return to the T.V programme after 5 years. Some of his poetry has been translated into Persian (Farsi) and Spanish by the poet/academic Saeid Hooshangi and will shortly be available on Dr Hooshangi's site and elsewhere. Grant is in contact with the Paris based Irish poet and translator Derry O'Sullivan and is pleased to exchange views on poetry with him. Currently, Grant and Egyptian poet friend Maysa Abdel Aal Ibrahim, a professor at the University of Alexandria and former pupil of Irish poet Desmond O'Grady ( whom Grant knows well from his trips to Limerick), are discussing working together on a poetry project. There may also be some Arabic translations of his poetry in the pipeline. Always on the lookout for different expressions of his work and different challenges, Grant has been working with composer/songwriters Liam McFadden whose site can be found at www.myspace.com/liammcfadden and Steffen Offermann who's at www.stoman.de. Liam and Grant have produced their first song based on one of Grant's poems and have also collaborated on some poetry/music pieces.Steffen and Grant's first two songs can be found at www.soundclick.com with vocals by Domenic Mercurio ('Mimmo') and Tricia Dovidio respectively. They are working on a third song based on Grant's poetry. Finally, he has recently published his first collection of poetry. It is called 'Street Magic' and its genesis owes much to the assistance of Robert Bagg, American poet and translator of (particularly) Euripides and Sophokles. 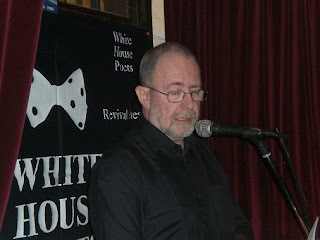 The photo above is of Grant reading at the Whitehouse Pub in Limerick. Below is a poem by the Egyptian poet Maysa Abdel Aal Ibrahim with collaboration from Grant D. McLeman. and spreading kisses in their air. but don’t try to follow them. it is loaded with the future. She has been in my thoughts since I saw her………. and I have no chance of being caught. because my river is full. for these last times ? no-one, that is, except me. and these delightfully saucy notes about today. that had happened five years ago. a mild neurotic thing, after all, you were a writer. not until I realised that these were your leaving notes. Will you photograph me tonight ? Will you do that for me ? but no noise like last night. He will keep me warm, blessings be upon Him……….. THE FOLLOWING POEMS ARE BY THE POET AND SCHOLAR SAEID HOOSHANGI WHOM I MET AT THE CUISLE INTERNATIONAL POETRY FESTIVAL AND WHO IS A LECTURER IN LANGUAGE AND PERSIAN LITERATURE AT UNIVERSIDAD DE SALAMANCA AND UNIVERSIDAD COMPLUTENSE DE MADRID. HIS WORK IS DEVOTED TO THE IRANIAN LANGUAGE, LITERATURE AND PREISLAMIC RELIGIONS. and the pebbles don't laugh when the waters pass by. an unwritten book and an empty dish. buried by a ferocius wind. the only nourishment of our life. there isnt even a place for your ultimate rest. which noone can take away. and make way for the weeds. silent witnesses of the calamity. and a tale with a happy end to fall asleep. in the empty sky of this morning with no rooster. the winds of the green breath of the grove. the scream of the rain has not been silenced. are the new performers of the live history. under the shadow of the quietness. vainly, but we are alive.